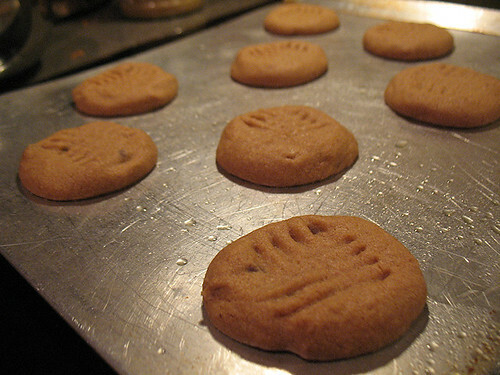 I’m keeping things short and sweet tonight, mostly because there’s not much to say about peanut butter cookies. It’s peanut butter… in a cookie. With chocolate chips, if you’re me. You really can’t go wrong. I made the Crispy Peanut Butter Cookies from Vegan With a Vengeance tonight. Actually, I think these are the first straight-up vegan p.b. cookies I’ve ever made; I baked a batch of the Big Gigantoid Crunchy Peanut Butter-Oatmeal Cookies from VWAV last year, but yeah, not exactly the same. These are simple cookies that get the job done. What else is there to say? Actually, I will say that these cookies are more sandy than crispy. That’s not necessarily a bad thing, as I prefer a chewier cookie, but still. They didn’t hold together very well during the baking sheet —> cooling rack transfer, although I might’ve been a little overzealous in my transferral and moved them before they were properly cooled. Whatever; they’re still tasty enough. I can’t say I’d rush to use this particular recipe again, but that’s due to personal preference more than major recipe fail. Don’t worry – my final two MoFo posts will be way more creative than this one. Pinky swear!